The European financial system is financially unsustainable, for reasons I have explained before, and reasons which were enunciated at the very start of the Euro project. Without deep, palpable reforms, all “victories” (or partial victories) are just another kick of the can down the road. The route to bedlam is interesting (and contrary to this chart, pock-marked with black swans) but the destination is the key: Europe must choose between meltdown and full fiscal integration. Neither choice is particularly appetising. This entry was posted in International Relations and tagged black swans, greece, greek endgame, merkel, papandreou, sarkozy, syrian war. Bookmark the permalink. This is why I follow your blog: you have a penchant for getting to the crux of the problems. Incidentally these (the ones you feature) are the most interesting posts I see on ZH as well. Hmm. The raw sewage is tempting but I’ll stick with the pile of manure for my main course. Have you considered the rotting cadaver? Absolutely. Gold is the best investment in the world right now. This only occurs once-in-a-generation. The financial system hasn’t grasped the consequences of all the technological revolutions and the shifts in the balance of power. The only drawback here is that it’s hard to get physical – we pay only 1.5% premium but something like 15% purchase tax. The good side is that I can hedge the asset from the freefall of dollars since most idiots here still think dollar is the “ultimate safe haven” and offer these hedging contracts at a price of nothing. USD/KRW is currently at 1200 – before the crisis “and” QEs they stood at something like 900 – and after all the turmoil I expect it to settle at somewhere near 600-700 since BOK is hawking inflation somewhat like the Bundesbank before Euro. By the time gold would have gone to places like the Andromeda galaxy and I’d have doubled the assets just from the currencies. Ye reap what ye sow. 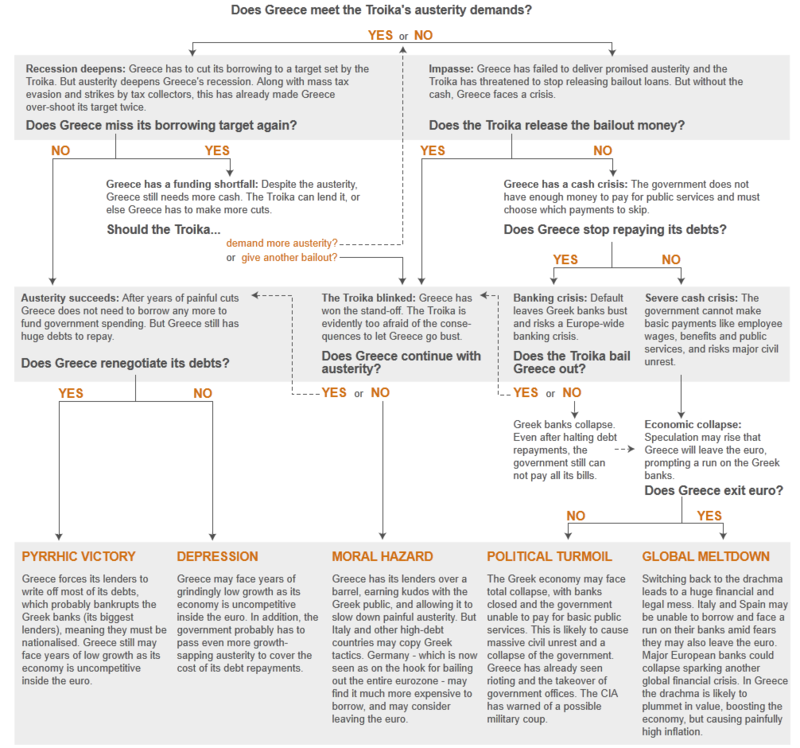 Greece should have retained the drachma, with it falling against other currencies, increasing demand for tourism. Was joining the Euro so the Greek elites could holiday elsewhere at parity? Germany got its lower currency and competitiveness, but at what cost? We have Malcolm Turnbull, otherwise known as “the member for Goldman Sachs”, whose former employer fiddled the books for Greece to join the EU, and who himself calls for Australia to have a carbon tax so they can reap the riches to be gained from trading thin air. Wouldn’t it be nice if our leaders worked for our interests instead of against them? Tell me I’m dreaming! Carbon trading is another hilarious derivatives ponzi. >>> Wouldn’t it be nice if our leaders worked for our interests instead of against them? Tell me I’m dreaming! You’re dreaming, until we hold them accountable. One of the biggest problems is that, in many cases, the crooks, thieves, and charlatans behind all this mess — mainly the problem with any true democracy, that of “bread and circuses”, really, are often gone from office and sometimes long dead before the full calamity strikes. Certainly this is the case in the USA, with the ridiculous Social Security and Medicare Ponzi schemes sucking more and more out of the pie with each passing year. The %$#%$#^ bastards who sold those idiocies to the US public have been dead for 50 and 20 years, respectively. Of the options offered, the best seems to be “Global Meltdown”. Reset the damned game, hopefully with some new rules in place to prevent such chicanery the next time around. Not the least of which is that ALL GOVERNMENTS SHOULD BE REQUIRED TO USE FULL *GAAP* to track their revenue and expenditures. Open books, man. If it’s required to sell stock to someone on the stock exchange, it should be demanded of anyone (i.e., government) selling government bonds, too. It won’t stop crap from happening, but it’ll certainly reduce the damages when it does by making the situation visible well beforehand. Yes open books is a very good idea.